It’s hard to resist those perfectly stacked Cranberry Bliss Bars inside the coffee shop case of sugary delights. In fact, sometimes it seems like those frosting-covered treats are begging to be enjoyed with your daily cuppa. Unfortunately, it’s hard to ignore the heaps of sugar, butter, and empty calories lurking inside them. 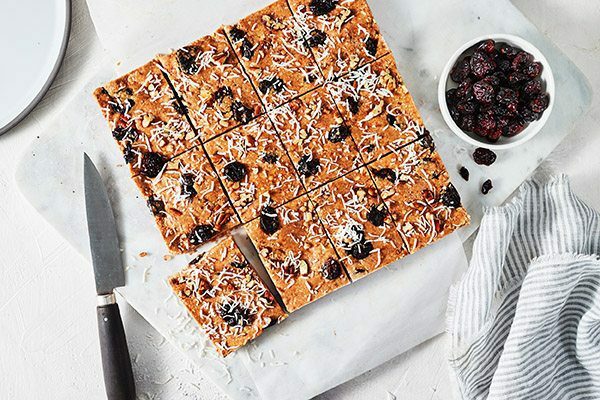 These Cranberry Bliss Bars, made with Shakeology and other wholesome ingredients are a healthier twist on a well-loved treat. With just 9 grams of sugar, compared to 26 grams in the originals, these bars are just sweet enough. Perhaps best of all, these Cranberry Bliss Bars come together in a cinch without any baking. Simply combine the ingredients in a food processor, press them into a baking pan, and set them in the fridge to chill. They can be part of a healthy grab-and-go breakfast, and will satisfy a midday sweet-tooth. 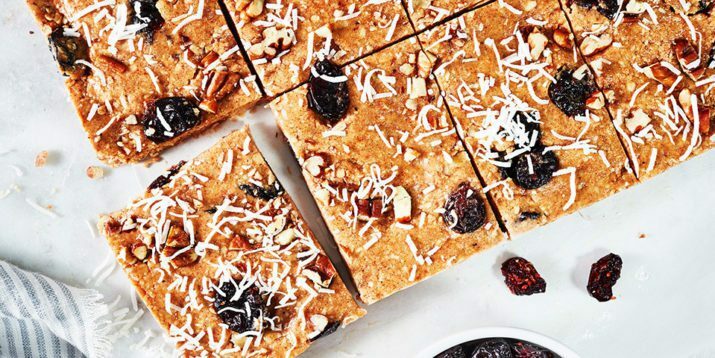 For a firm texture like the blondies they’re based on, keep refrigerated until ready to eat. The bars will soften at room temperature, but they’ll still taste yummy! 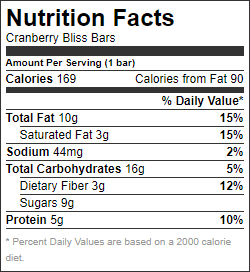 For a vegan Cranberry Bliss Bar, swap the honey for maple syrup and use Vegan Vanilla Shakeology. If cranberries aren’t your thing, you can use a different type of dried fruit instead. 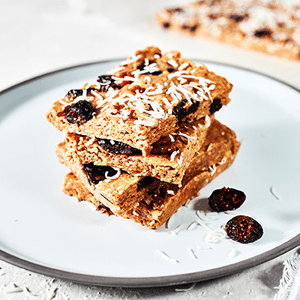 Raisins or dried currants will give the bar a similar look. Or, try chopped dried pineapple, mango, or apricots for a summery flavor. Line an 8 x 8-inch pan with plastic wrap (or aluminum foil). Set aside. Combine oats and coconut in food processor; pulse for 20 seconds. Add almond butter and honey; pulse until blended. Combine almond butter mixture, pecans, pumpkin pie spice, Shakeology, and cranberries in a large bowl; mix well with clean hands or a rubber spatula. Lightly press oat mixture into pan. Refrigerate for 1 hour, or until set.